Today is Remembrance Sunday: the day in which the we have commemoration ceremonies for Remembrance Day - 11 November in which we remember those who've died in times of war. As part of these ceremonies, wreaths of poppies are laid on the memorials and two minutes' silence is held at 11 a.m. I was in the car today at exactly 11am, driving from our disaster recovery site back to our main site and I experienced the eerie 2 minutes that occurs at 11am on the dot - the 2 minutes of silence. Now this isn't normally eerie, but what was was the fact that every single radio station did exactly the same thing: they all played the "half-muffled" chimes of Big Ben and then dropped into silence for the full two minutes. Some went completely silent. Others were broadcasting live from the Cenotaph in Whitehall in London so you got to hear the silence of London, which is quite eerie in itself. 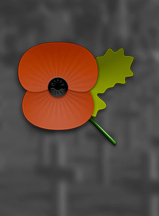 I've "experienced" Remembrance Sunday before, but I've never been in a position to check all the radio stations. I've also not felt the shivers that I got when I realised they were all honouring the 2 minutes silence. It was actually quite moving.